Coming back to Geylang reminded me of those two weeks we spent in Singapore last year. While the place is known to be a red light district (not the types we have here in the Philippines or in Amsterdam), Geylang is filled with numerous food selections including stalls of fruits, a strip of hawkers (no pun intended), and affordable dim sum places to boot. 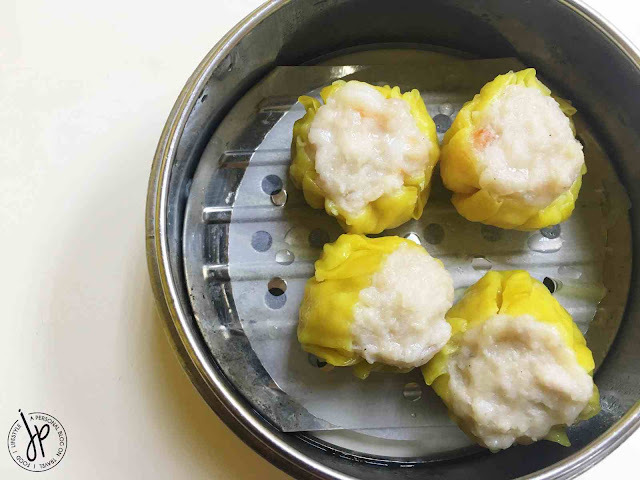 One dim sum place we’ve been coming back to is 126 Dim Sum Wen Dao Shi, tucked in the main street of Sims Avenue in the heart of Geylang. 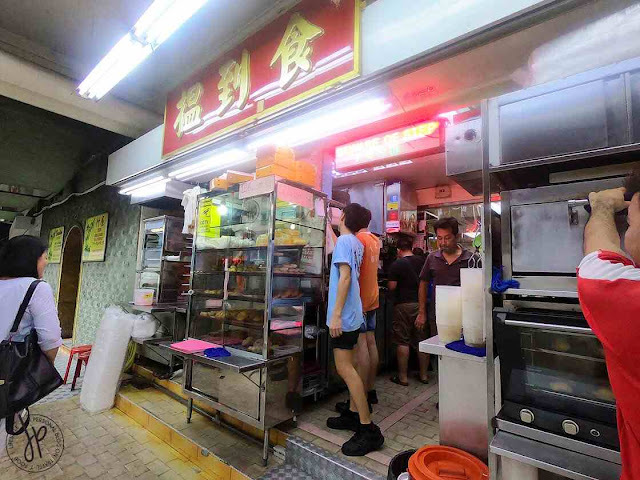 It’s funny because we discovered this while I was craving for siomai (shu mai) one time and this place happened to be just a few steps away from our accommodation in Lorong 15. We didn’t know it was this popular in Singapore! 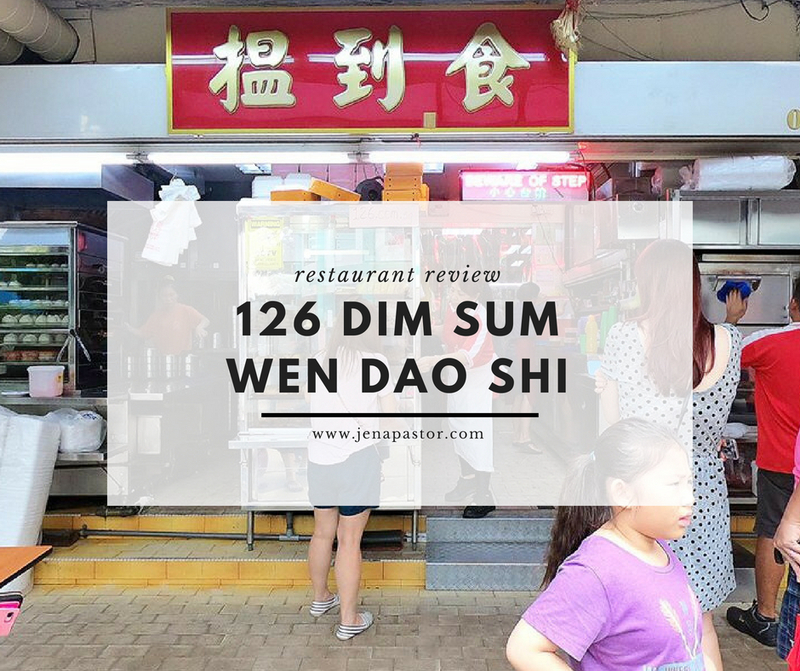 On our recent vacation, we went back to 126 Dim Sum for an afternoon snack. 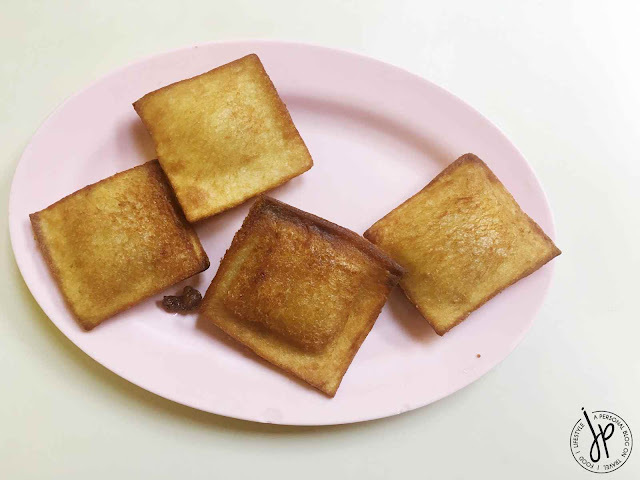 The traditional Hong Kong style dim sum restaurant can be easily spotted because people frequent the place whether for dine-in or take-out. 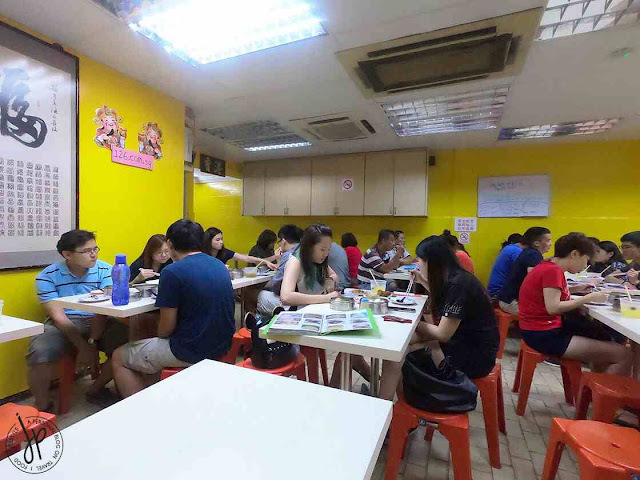 Inside 126 Dim Sum's branch in Geylang. We specifically dropped by around 2:30 PM, hoping it’ll be less crowded at that time. This place normally gets full in the evening, with additional tables and chairs perched up at the side of the road. The staff were prompt to attend to us and assigned us a table near the wall. They handed us the menu and gave us time to take our orders. 126 Dim Sum's menu. For you order, you will be given a pencil and a piece of paper. Write down the dish number and the number of orders. In this case, we wrote down "#187 - 1 order". Their menu was kept simple, with photos of their food pasted on a bond paper, food description and prices written by hand, and pages inserted in a clear book. 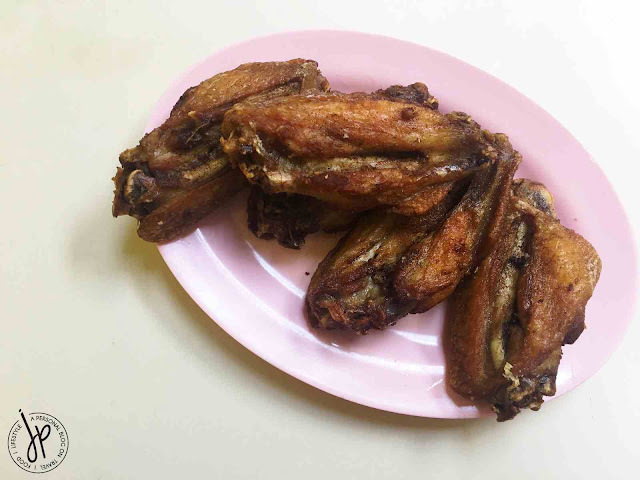 They have tons of dishes – from the usual dumplings and chicken feet, to the sought after chili crabs, and even to the exotic frog legs! Since it was only an afternoon snack, we ordered three food items on the menu and two drinks. 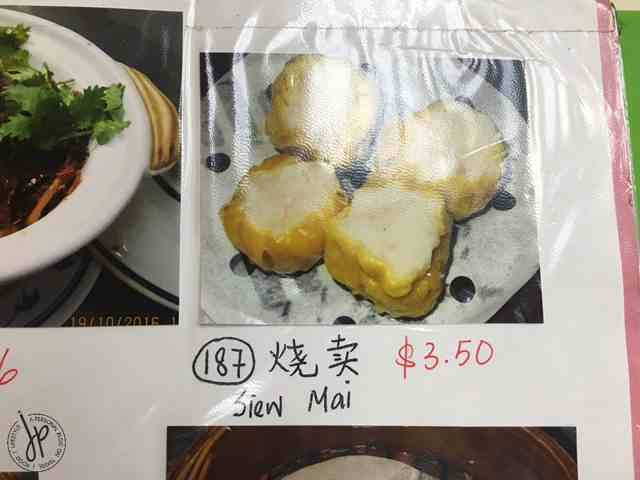 First, I picked an order of Siew Mai, a combination of pork and shrimp. In every dim sum place I visit, this is always on top of my list since dim sum places in Singapore seem to always have freshly made shu mai (and not the frozen one). It’s also slightly bigger in size than what we’re used to have in Chinese restaurants in the Philippines. The next on our list is their Fried Chicken Wings. For its price, it’s not as fancy as those found in buffalo type chicken wings, but this reminds me of fried chicken from home. It’s a repeat for us; we ordered this one last year, too and we really liked its taste. The last food was my husband’s choice: Crispy Yam Pie. I wouldn’t normally get this as it doesn’t look inviting in the menu, but man it’s so good! It’s crusty on the outside and the yam filling is soft and hot inside. Because there’s just the right amount of sweetness, you’ll find yourself wanting more after every bite. 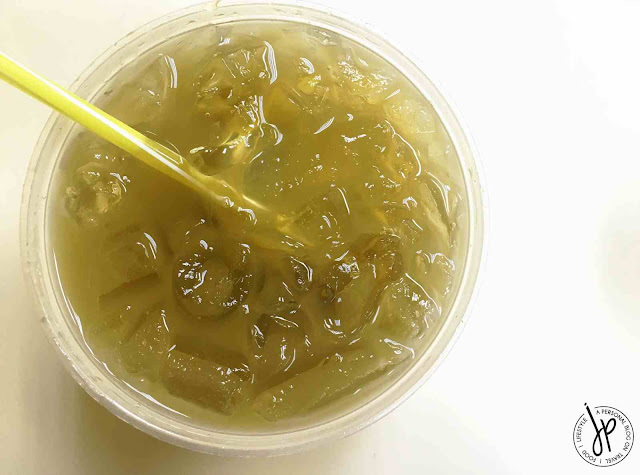 For our drinks, we noticed other customers getting the restaurant’s concoction of juices in microwavable soup containers (weird, right?!). 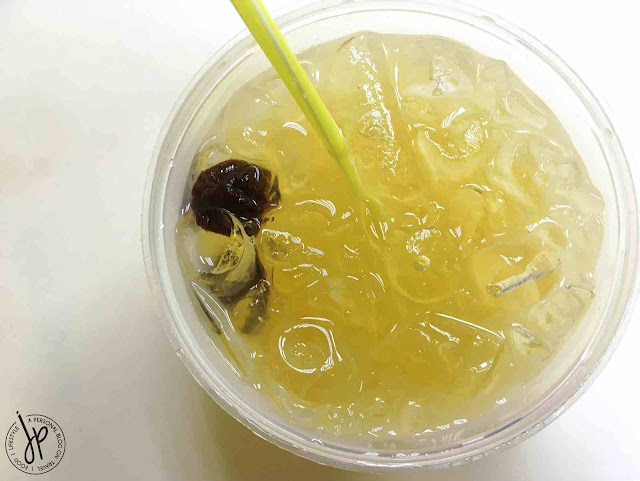 Out of curiosity, we ordered Sugar Cane with Lemon for my husband and Lime Juice with Sour Plum (kiamoy) for me. Let me just say to each his own. My husband liked his, but I didn’t like my husband’s choice of drinks at all. As for my own selection, it’s better than the sugar cane but I didn’t like how sour it can get. I will stick to sodas or any branded juice drink next time. I like 126 Dim Sum Wen Dao Shi’s simple set-up. They kept the place modest and traditional and they serve the best dim sums I ever tasted. No wonder this is a must-visit place ever since they have established their name in 1985. 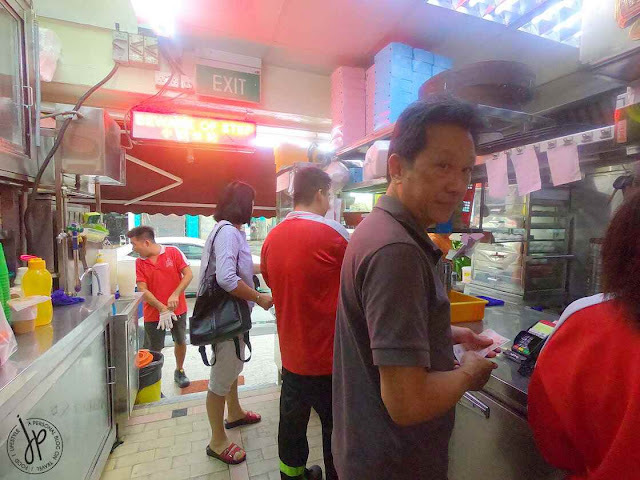 If you can’t get a seat or if you want to taste more of their dishes, there’s always a take-out counter with readily available dim sums to satisfy your cravings. Pay your bill at the cashier before heading out. 126 Dim Sum Wen Dao Shi's take out counter right in front of the restaurant.